Krystina Muller is a professional knife and blade sharpener in the Orlando area that services residential and commercial clients. She has been sharpening knives for over 20 years in the Sarasota and the Tampa Bay area. Sharpening a knife or blade takes skill in order to be done properly. A professional sharpener is the best way to keep your knives and blades in the best condition. 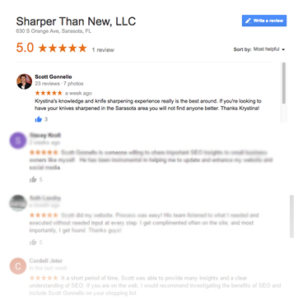 Sharper Than New serves the Orlando area and has been expertly sharpening knives for professionals and home use. There are few things more frustrating than trying to chop produce with a dull knife or peel an apple with a paring knife that just seems to slip against the skin. Sharper Than New will sharpen and clean your blade to make it better than when new. Your knife and kitchen blades are made from various types of metal. It’s important to know what you are dealing with when you sharpen them. Sharpening is a process. 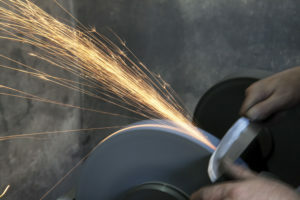 It takes grinding and honing to get the blade sharp and to the right shape. This is why professional sharpening is best for your knives. Keep your knives at their best and sharpest. Contact expert knife sharpener, Krystina Muller owner of Sharper Than New for friendly and affordable knife sharpening services. Jacksonville, Tampa, Orlando, Sarasota, St. Petersburg, Clearwater, West Palm Beach, Boca Raton, Melbourne, St. Augustine, Key West and Ft. Meyers.